As our population shifts and ages, the care needs for our elders continue to change and evolve. Today’s generation of family and professional caregivers faces new decisions and challenges, as well as previously unavailable options. 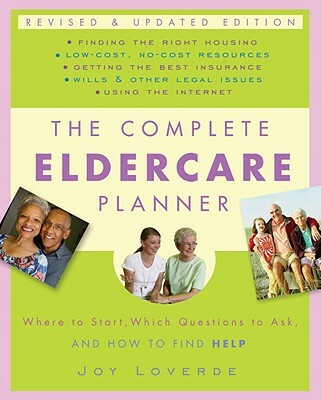 This thoroughly revised and updated 2009 edition of The Complete Eldercare Planner equips you with reliable, up-to-the-minute information to help you plan and manage caring for your loved ones. •Senior housing–move or stay put? JOY LOVERDE, a leading consultant in the senior/active adult industry for thirty years, shares her expertise with family members and professionals who want to successfully plan and manage eldercare and caregiving issues. Her work has been featured on Today, the CBS Early Show, National Public Radio, and in USA Today, the Wall Street Journal, and Consumer Reports. She lives in Chicago. Visit her website at ElderIndustry.com.